The Style developed in The Byzantine Empire, also known as the Later Roman or Eastern Roman Empire. 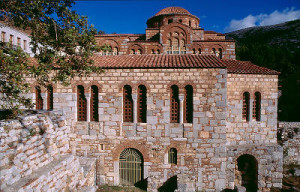 Hosios Loukas, 10th century monastery, Middle Byzantine Period, Distomo, Grece. Byzantium, an ancient Greek colony, became the Capital of the Empire in 330 AD thanks to Emperor Constantine who name it after him: Constantinopolis or “Constantinople” ( today Istanbul ). 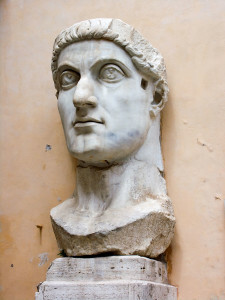 Colossal marble head of Emperor Constantine. Capitoline Museums, Rome. Constantinople had been purposely founded as the Christian counterpart and successor to the leadership of the old pagan city of Rome. The new capital was in close contact with the Hellenized East, and the contribution of Eastern culture, though sometimes overstressed, was an important element in the development of its architectural style. 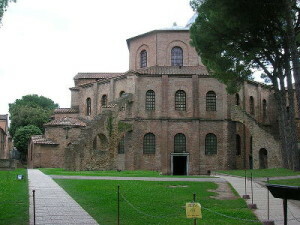 Prime examples of early Byzantine architecture date from Justinian I‘s reign and survive in Ravenna and Istanbul, as well as in Sofia. Basilica of Sant’ Apollinare Nuovo, early 6th century, Theodoric the Great, Ravenna, Italy. In Ravenna, we have the longitudinal basilica of Sant’Apollinare Nuovo, and the octagonal, centralized structure of the church of San Vitale, commissioned by Emperor Justinian but never seen by him. Basilica of San Vitale, part of the UNESCO World Heritage, built by the Ostrogoths (but completed by the Byzantines), consecrated in 547, Ravenna, Italy. 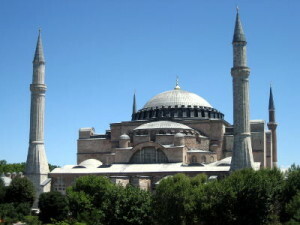 Justinian’s monuments in Istanbul include the domed churches of Hagia Sophia and Hagia Irene, but there is also an earlier, smaller church of Saints Sergius and Bacchus (locally referred to as “Little Hagia Sophia), which might have served as a model for both in that it combined the elements of a longitudinal basilica with those of a centralized building. Hagia Sophia, Byzantine architecture, built between 532 and 537, the most imposing church in the world, Istanbul, Turkey. 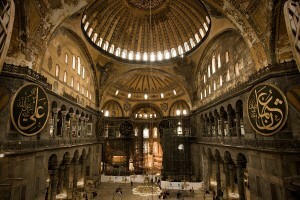 Byzantine architecture has a lot in common with early Christian architecture. This is not surprising, as most early Christian buildings were built at the command of the Byzantine Emperor Constantine. Why don’t we just classify early Christian architecture as Byzantine architecture and be done with it? The reason is that Byzantine architecture diverges from early Christian architecture during the reign of the Emperor Justinian, around the middle of the sixth century. From the size and shape of their churches to the style of their decorations, the Byzantines established a style and form all their own. This style persisted in Eastern Europe for another thousand years, while Western Europe developed new, Western styles of architecture. 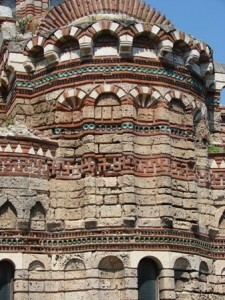 Byzantine architects were eclectic, at first drawing heavily on Roman temple features. Their combination of the basilica and symmetrical central-plan (circular or polygonal) religious structures resulted in the characteristic Byzantine Greek-cross-plan church, with a square central mass and four arms of equal length. The most distinctive feature was the domed roof. The circular: (or “central”), represented by the great octagonal church once at Antioch. Walls: These were often constructed of brick. Internally, all the oriental love of magnificence was developed, marble casing and mosaic being applied to the walls; hence a flat treatment and absence of mouldings prevailed. Externally the buildings were left comparatively plain, although the facade was sometimes relieved by alternate rows of stone and brick, in various colors. Nessebur’s Church of Christ Pantocrator, built during the Byzantine and Ottoman eras, Nessebur, Bulgaria. Openings: Doors and windows are semicircular headed, but segmental and horse-shoe arched openings are sometimes seen. The windows are small and grouped together. 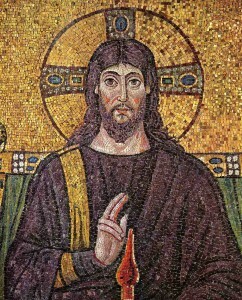 The universal employment of mosaic in Byzantine churches, and the consequent exclusion of painted glass, rendered the use of such large windows as the Gothic architects employed quite inadmissible, and in the bright climate very much smaller openings sufficed to admit the necessary light. Hagia Sophia Cathedral, Istanbul, Turkey. Roofs: The method of roofing these buildings was by a series of domes formed in brick, stone, or concrete, with frequently no further external covering. The Byzantines introduced the dome placed over a square or octagonal plan by means of pendentives, a type not found in Roman architecture. Columns: Capitals sometimes took a form derived from the Roman Ionic or Corinthian types or consisted in the lower portion of a cube block with rounded corners, over which was placed a deep abacus block, sometimes called a “dosseret“. These were used constructively, but were always subordinate features, and often only introduced to support galleries, the massive piers alone supporting the superstructure. 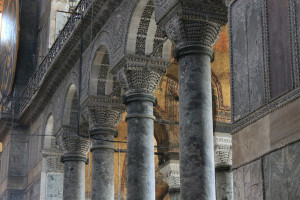 Byzantine columns in Hagia Sophia, Istanbul, Turkey. Mouldings: their place was taken by broad flat expanses of wall surfaces. Internally, the decorative lining of marble and mosaic in panels was sometimes framed in billet mouldings, probably derived from the Classic dentils, and flat splays enriched by incised ornamentation were used. Externally, the simple treatment of the elevations in flat expanses of brickwork, with occasional stone banded courses, did not leave the same scope for mouldings as in other styles. Ornament: The scheme of ornamentation was elaborate in the extreme, the walls being lined with costly marbles with the veining carefully arranged so as to form patterns, and the vaults and upper part of walls with glass mosaic having symbolic figures, groups of saints and representations of the peacock (the emblem of immortal life), the whole forming a striking contrast to the less permanent painted frescoes usually adopted in the Western Romanesque churches. 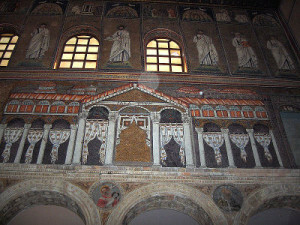 Sant’Apollinare Nuovo in Ravenna, Italy: “Christ surrounded by angels and saints”. Mosaic thus was used in a broad way as a complete lining to a rough structure, and replaced architectural lines. The great characteristic of Byzantine ornament as compared with Classical is the pattern; it’s incised instead of seeming to be applied.